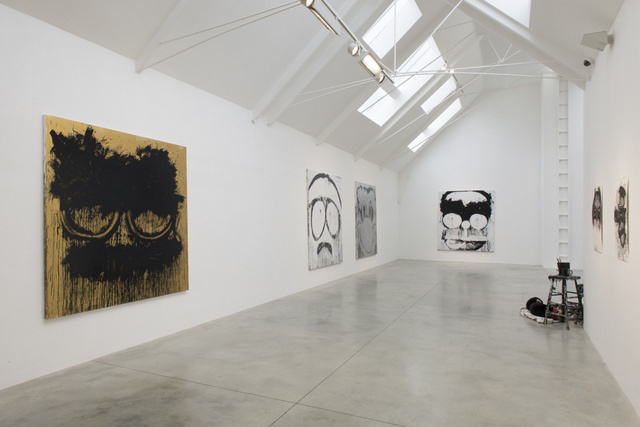 Joyce Pensato's decision to paint portraits of cartoon and comic book characters might place her firmly in the stable of contemporary pop art but her style most closely resembles the works of artists such as Jackson Pollock and Jean-Michel Basquiat. 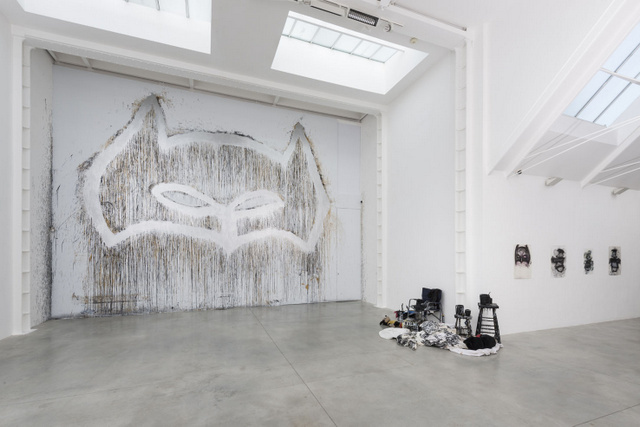 This exhibition contains her take on Felix the Cat, and Homer and Marge Simpson, but most impressive is the gigantic portrayal of Batman's mask in a site-specific painting that must be at least 20 feet tall. Despite the scale and eye-catching nature of Pensato's work, it's not these paintings that are the most appealing aspects of this exhibition. 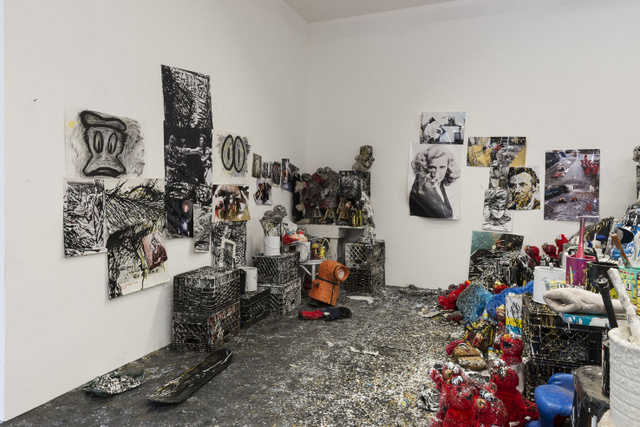 As part of this installation the artist has relocated much of her Brooklyn studio, known as Joyceland, into the gallery. 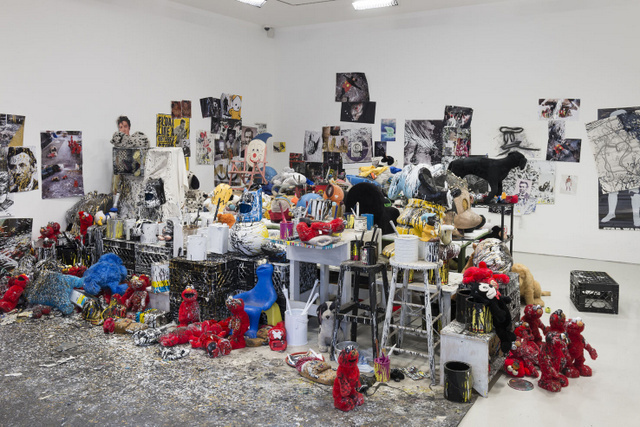 An artist's studio is often a reflection of their style and this is definitely the case here — if anything her work is measured compared to the chaos that is Joyceland. 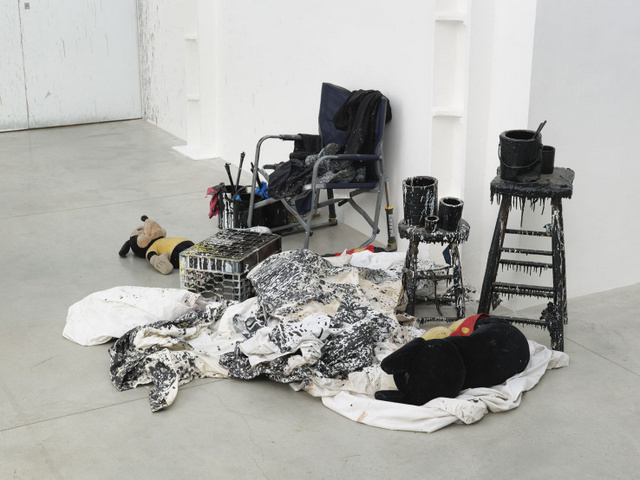 There are pots of paint everywhere, celebrity portraits pinned to the wall and scatterings of stuffed toys and related merchandise — including a papier mache Kenny from South Park. The majority of the studio is located in one room but small sections have been placed throughout the gallery and this interplay breathes greater life into the paintings. The paintings taken on their own can feel a tad uninspired at times but coupled with the studio sections they become an organised outpouring that emerges from the cauldron of ideas present in Pensato's studio. 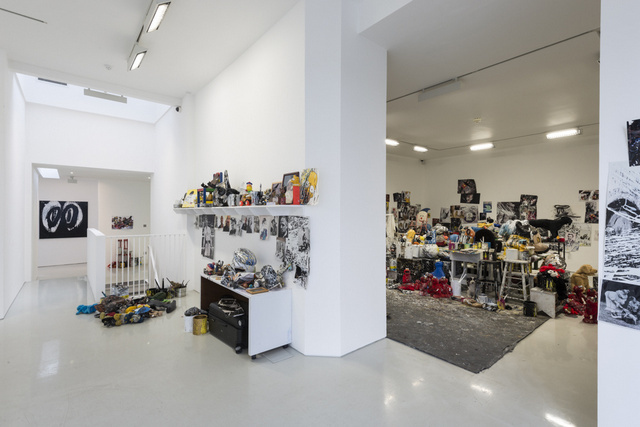 This exhibition allows visitors to enter Pensato's mind and connect the dots from the many sources of inspiration in Joyceland, through to the final products hung on the walls of the gallery.